Jawbone grafts are a modern dental technique used to reconstruct damaged areas of bone. Jawbone grafts may be necessary if gum disease, trauma, or medical conditions have caused your jawbone to deteriorate. Bone grafts enable dental implant surgery and prosthetics where it might not otherwise be possible. You may be a candidate for a jawbone graft if you have missing teeth and your bone has deteriorated significantly. Jawbone damage can result from gum disease, trauma, or medical conditions, such as cancer. 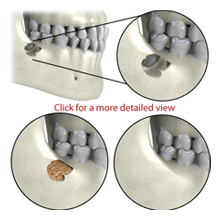 Jawbone grafts can make it possible to receive dental implants to replace missing teeth. Your dentist can determine if you are a candidate for a jaw bone graft by examining your mouth and jaw. Your dentist may take X-rays or order a computed tomography scan (CT scan) to determine the quality and quantity of your bone. A CT scan provides a more detailed image than an X-ray. A CT scan is a painless procedure and simply requires that you remain motionless while the pictures are taken. Autografts, allografts, xenografts, and alloplastic grafts are the most common types of bone grafts used for jawbone reconstruction. Autografts use bone taken from your own body. The hipbone is one place bone is taken from. The posterior areas of your own jaw is also another common source of bone. Autografts are very compatible with your body. They are the top choice for jawbone grafting and produce the best bone regeneration results. Allografts are taken from the donated remains of other people. Bone donations obtained from cadavers undergo rigorous tests and sterilization. After an allograft is placed in your jaw, it eventually transforms into your natural bone. It is considered a very safe source of bone. Xenografts are bone tissues taken from animals. Xenografts are extensively tested and sterilized before they are placed in your jawbone. A xenograft is a filler agent. Overtime, your natural bone replaces it. Alloplastic grafts are composed of man-made materials. The artificial material is similar to your bone. Your natural bone fuses with the alloplastic graft and eventually replaces it. Other types of alloplastic grafts serve as structures for your bone tissues to grown on. You will have follow-up appointments with your surgeon to ensure that your graft is healing properly.